about the PCs for People corporate recycling process. How much does it cost to recycle my business’s/organization’s electronic waste? It is FREE for nearly everything. The exceptions are CRT (tube) computer monitors and televisions which cost 55 cents per pound to recycle. 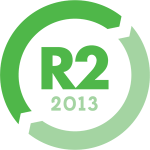 Recycling of multifunction copiers costs 22 cents per pound. What electronic waste do you accept? We accept nearly anything computer-related. Click here for the comprehensive list. Are all electronic devices accepted? No. 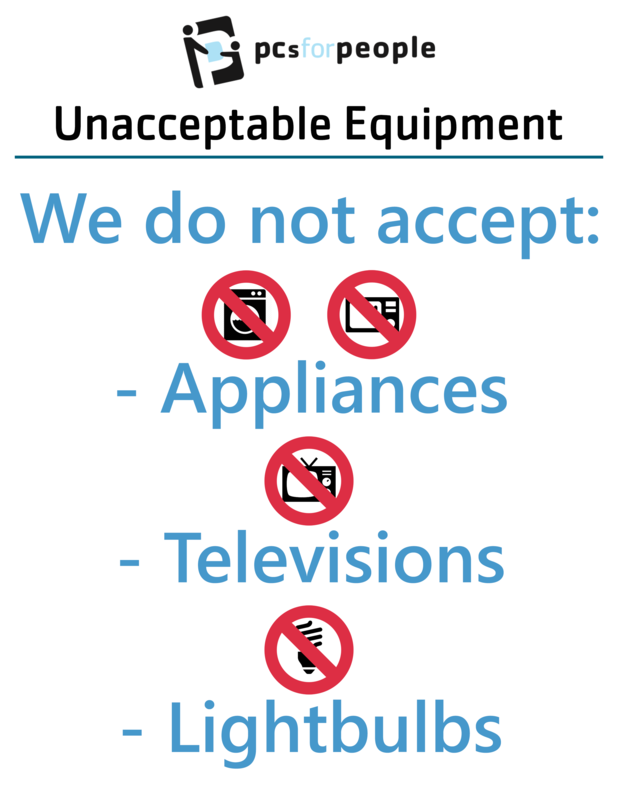 PCs for People cannot accept home appliances and light bulbs. Click here for details. Do you accept non-working computer equipment? Yes! We accept any computer, no matter age, condition, or brand. The same goes for computer accessories. Do you refurbish all the equipment you receive? We refurbish as many computers as possible. However, some are damaged beyond repair, or are too old to work with current operating systems. We follow a strict zero-landfill policy, so if a computer isn’t suitable for refurbishing, usable parts are removed and used for refurbishing other computers. Everything else is broken into its natural components and recycled with an independently audited recycling partner. Functioning computer monitors are distributed with desktop computers. Broken and obsolete monitors, cables, circuit boards, and other miscellaneous electronics. are recycled. Do we need to have manuals and discs? If you have the manuals and discs, we will recycle them, but they’re not necessary. PCs for People is a 501(c)(3) non-profit organization that provides affordable computers, computer repair, and internet service to low-income families and nonprofits across the country. Click here for computer recipient requirements. In addition, we provide digital literacy training to people with limited technological experience due to social, physical, or economic circumstances. PCs for People has distributed over 60,000 computers, subscribed thousands of families to low-cost internet, and recycled millions of pounds of electronics. Our corporate services include secure IT asset disposition and AAA NAID-certified data sanitization. Who are your recycling partners? PCs for People has more than 400 recycling partners that include large corporations, small businesses , manufacturers and high-tech firms, nonprofits, local and state governmental agencies, and K-12 schools, colleges and universities. We will gladly provide references upon request. How do I get rid of computers and other electronic waste? Businesses qualify for free pick-up when recycling 15 or more computers. Request a pickup by clicking here. Alternatively, you may write an email that includes the location, quantity and type of equipment to recycle@pcsforpeople.org .or call us at 651-354-2552 extension 829. Individuals can learn more about where to drop off equipment here. A data breach would be devastating to our company/organization. Will you remove important documents and other sensitive data? Yes. PCs for People guarantees all data on hard drives is destroyed. We follow Department of Defense and National Institute of Standards and Technology guidelines, so all data are deleted and unrecoverable. Click here for details. What credentials do PCs for People employees have? All PCs for People Access Employees are thoroughly vetted. Each person has passed a criminal background check, drug screening, employment history verification, and I-9 Employment Eligibility Verification. In addition, Access Employees have signed a confidentiality agreement verifying they will protect the confidentiality of all information taken into custody by PCs for People. Do we need to erase the hard drives before giving them to you? You may wipe the hard drives prior to turning computers over to us, but we’ll still erase every hard drive using our AAA National Association for Information Destruction (NAID) process. All hard drives are wiped three times and loaded with Windows 10 or Linux Mint depending upon the age of the computer. Each hard drive serial number is tracked and a receipt will be sent to you cataloging the wiping process. Any drive that fails the wiping process is physically destroyed. Our policy is to remove the hard drives from computers before disposing of them. Will you still take our computers? Yes. When we get computers without hard drives we’ll put drives in as part of the refurbishing process. How is equipment protected when it’s in your truck? 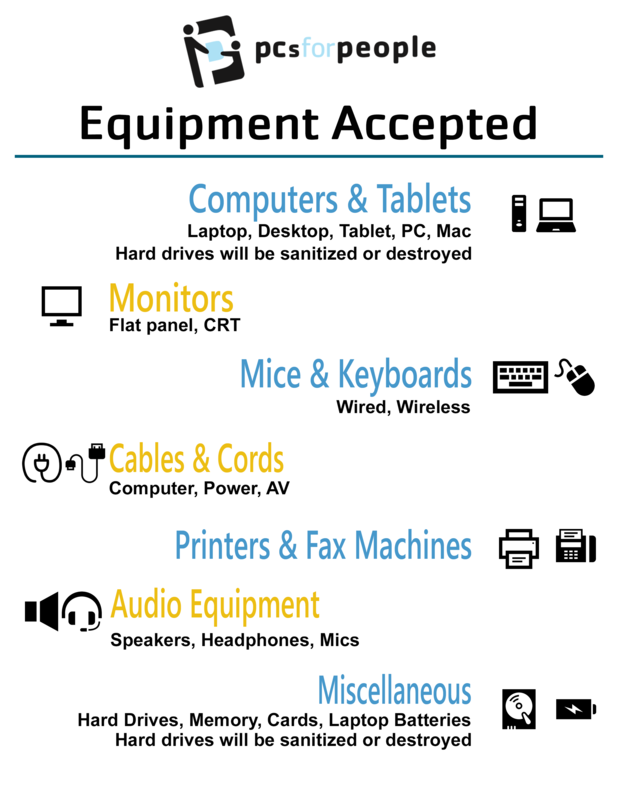 When all your equipment is safely loaded and locked in our truck, you’ll sign a transfer of ownership giving PCs for People possession of and responsibility for the E-waste. At the same time, our liability insurance assumes coverage of the electronics in the event of loss from theft, wind, tipping/spillage, or other atmospheric conditions until arrival at our secure wiping warehouse. What do you do with the equipment when you get it to the PCs for People warehouse? PCs for People uses a precise process to ensure protection of your data. Upon arrival at our warehouse, Access Employees unload all equipment from the truck and put it in a secure staging area. Next, the hard drives are removed from the computers and placed in a container specifically labeled for each customer. After all the hard drives have been removed, the container(s) are moved to the secure sanitization area. Meanwhile, the computers (without hard drives) are checked, cleaned, and refurbished whenever possible. Unusable computers, cables, printers, and other peripheral devices are sorted and recycled. What happens to the hard drives? All hard drives that enter the secure storage area are erased or physically destroyed by an Access Employee. Only PCs for People Access Employees are allowed to work in this area. The facility is monitored at all times by a video security system capable of recording over 90 consecutive days of video. The storage area is also protected by an alarm system and motion sensors when the building is unoccupied. How do you guarantee all data is erased? PCs for People Access Employees ensure drives are being fully sanitized by following a strict quality control process. The name of the technician sanitizing the data. One drive per fifty is sampled for quality control, and at least one drive needs to be sampled for each customer lot number. When a drive is randomly selected for the quality control inspection, it is checked by a different technician than the one who performed the data wipe. If data is recovered from the drive, all media from that customer's lot is re-sanitized. After this sanitization process, two drives are sampled for every fifty devices in the customer's lot. If the second sampling reveals another device with retrievable data, PCs for People will re-inspect all our hardware and software used in the data sanitization process. If all hardware and software is fully operational, the drives will be wiped and verified for a third time. Should data be recovered after the third verification, all drives are destroyed.  You will receive a single PDF file that contains the signed transfer of ownership, certificate of destruction, and data sanitization log within ten business days of the pickup. The data sanitization log lists all the hard drive serial numbers and verifies the drives have been sanitized or destroyed. What do you do with SSDs (solid state drives)? At present, all SSDs are destroyed because there is no way to guarantee they are wiped so the data are unrecoverable. When the National Association for Information Destruction (NAID) approves a standard for information destruction stored on SSDs PCs for People will implement the process to wipe data and reuse these drives too. How are hard drives destroyed? If hard drives fail the sanitization process, or if you request hard drive destruction, they are labeled for physical destruction and crushed using a twelve-ton shop press with a metal-spiked ram. Once the media is destroyed, it is removed from the secure area and placed in the recycling. SSDs are destroyed in the same way. Am I eligible for a tax break if I recycle my old electronics? Possibly. PCs for People will provide a receipt that contains our tax ID number and the IRS code for a tax deduction for property donated to a charitable organization under applicable rules and regulations and a. The charitable deduction for contributions of technology equals the fair market value (retail used value in the current market place) of the donated property. By law, nonprofits including PCs for People cannot determine the value of your donation. One way to calculate a value of your electronics donation would be to find similar products for sale on the internet.